Having moored in the long term moorings we decided to move early today. There is, it seems, a resident nosy parker who reports all those that stop here to BW. 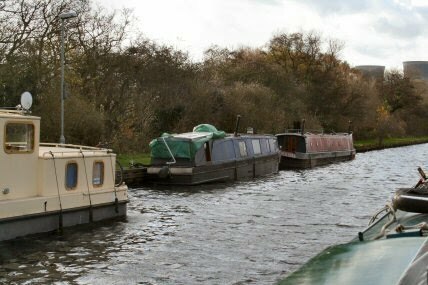 Before we moved the boat in front (a very friendly couple who live aboard) went off for a quick trip to the facilities quarter of a mile away near the Bramwith Bridge. The lock at Bramwith is one that has two halves. If you are 60 foot or under you can use the smaller one. A 70ft would have to use the larger part. The larger bit has various winches to help with the gates if needed. Once through the lock we found an old 'friend'. 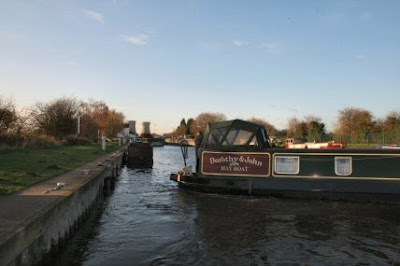 The boat that looked a bit worse for wear at Thorne had passed us in the late evening and moored just past the lock. At least the engine works. 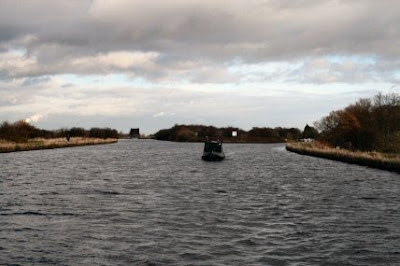 Heading off towards Doncaster the canal behind is the New Junction Canal and leads to the Aire and Calder. Next time maybe. 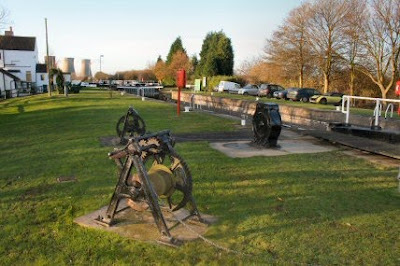 Past the power station and you come to Barnby Dun and the lift bridge. 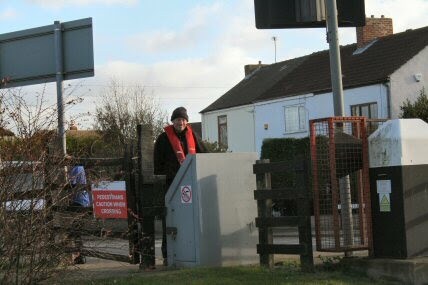 This well used bridge does not need singleton boaters :-) We were very lucky as there was another friendly BW person who worked the bridge for us. By the time we were through there must have been twenty plus cars on both sides waiting to cross. At Sandall Grove and right next to the canal there is the above church. One of these days I am going to stop here and have a look around. 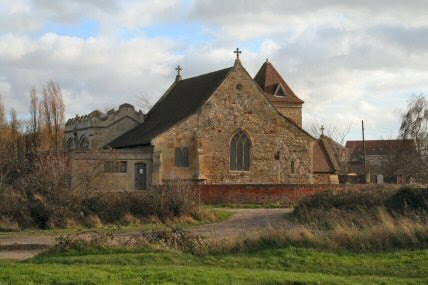 There are so many additions to it and of obvious different ages it must be worth a look. 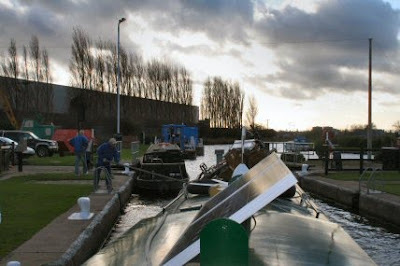 Long Sandall Lock is the first of the large commercial sized locks we have come across since the Trent. 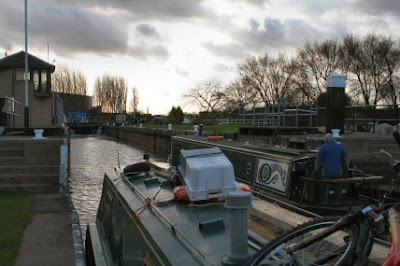 You are well advised to be well moored up when emptying the lock as it does come out at quite a rush. Getting out was another of those fraught with bumps. Tim had to hold me off with the boat hook till I got going and I still managed to bump the BW boats ahead. The touch was as light as a feather - honest. 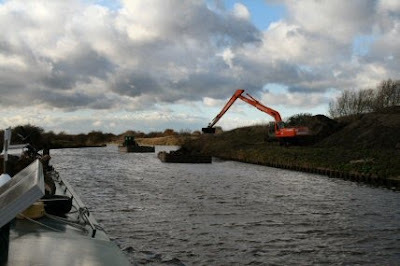 Once out of the lock and around the corner and there was a tug with barges taking away spoil off the bank. The wind didn't help a lot going past here. 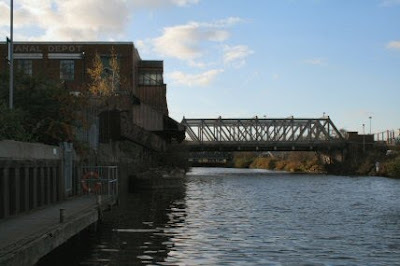 The final chug into Doncaster is past Strawberry Island and the very full moorings there. The first view of Doncaster has changed greatly since the last time I was here. Lots of new building and there are still demolitions being carried out.